A white poodle, exquisitely clipped and groomed, may look as if he or she were born to wear diamond collars. White poodles are almost an icon of wealth and sophistication. While they are certainly elegant dogs, the personality of a white poodle is entirely unrelated to his or her color and appearance. Let’s start by talking about the clip. Did you know that the clip was not originally meant for style, but to help a working dog do his job? Poodles were originally retrievers. The clip we see most often, the Continental, has the hindquarters, face, legs and base of the tail shaven, the coat left full on the chest, with pompoms at the ankles and sometimes the hips. This clip was designed to rid the dog of the heavy coat wherever possible, in order to make it easier for him to swim, while leaving fur over the major internal organs and the joints for insulation. Despite the image maintained by people who only see them from afar, poodles, no matter what their color, are cheerful, stable, and very sociable dogs. They are also among the most intelligent and easily trained of all breeds. They love to please, and are very sensitive to your approval and correction. 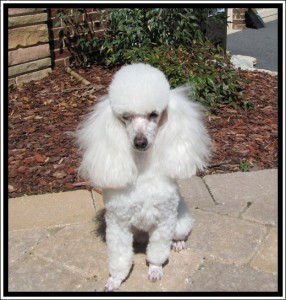 A poodle considers itself a member of the family, and that’s certainly how they are raised here at Homestead Poodles. They are completely home raised, and never kept in cages or kennels. This means your poodle will be forthright and friendly, completely socialized, and will have no trace of nervousness or hypersensitivity. If you ever come across a neurotic poodle, it’s not because it’s a poodle, but rather because it hasn’t been well-socialized.